Cymbal-Banging Monkey is a small toy monkey that bangs two cymbals together. It is often seen perched on Cartridge Unit, as it cannot move by itself. Cymbal-Banging Monkey was said to be a lifelong pacifist, though it was the first to accept Bender's idea of destroying all technology. He may be completely a figment of Bender's imagination, as he is not on the wheel of robots and is not seen in the audience unlike the others island occupants. 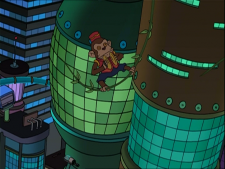 A spaceship that looks very similar to the Cymbal-Banging Monkey appeared in the non-canon episode "Reincarnation".